Hold My Order, Terrible Dresser: Show Notes for HMOTD 036: Might I... Move About? 1:30 Meddling: I went to Google Ngram in the hopes of finding a spike in "meddling" in the 1970s but about the only thing I did see is that use of the word has remained remarkably steady since the mid-'70s. 3:10 One of Rob’s most useful lines: Everything about the scenes at Lillian's house is great, probably most of all the ominous ticking of Mama's grandfather clock in every scene. And there was really never any question of not using "Might I... move about?" as the title of this episode. 5:16 "Bob Vance, Vance Refrigeration" What's really great is as I was listening to this episode in the car with Jenny (as I predicted I would be during our anniversary discussion), Jenny got mad at me for forgetting Bob Vance's name and then, boom! This classic Office clip played. For the record, I honestly did not intentionally forget Bob Vance's name for comedic purposes. When I was editing, there was no way I couldn't include this classic bit. 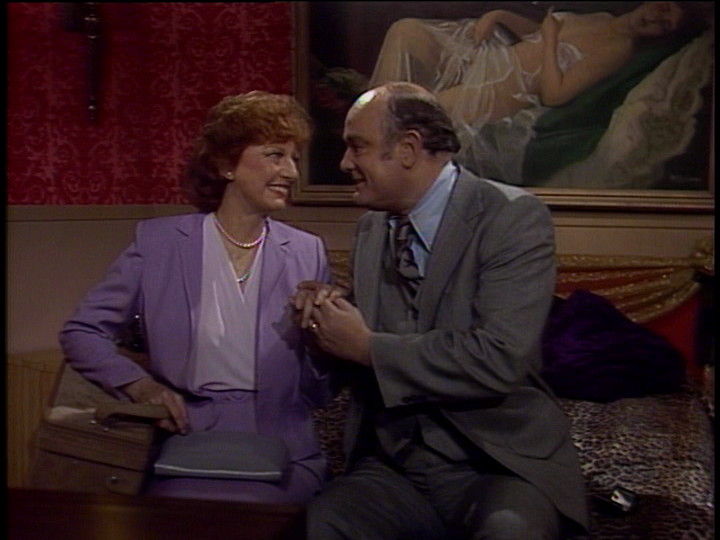 8:22/10:50 Herb and the Big Guy/Herb and Lillian: "A Simple Little Wedding" is a really funny episode. Herb gets to do his hyperventilation shtick again, but for my money one of the funniest bits is the Big Guy doing a 180 as soon as he hears that Les planned the bachelor party. Carol Bruce, though, is by far the MVP of "A Simple Little Wedding." From start to finish (including the final scene with Herb), she's a comedic dynamo. Let's be honest, kids, without Carol Bruce and Mama Carlson, we never would've gotten Jessica Walter and Lucille Bluth. 13:00 Monopoly: Here's a précis of the tale of Monopoly, from reformist Quaker roots to Depression-era wish fulfillment. And if you want to hear more in podcast form, go to the always excellent 99% Invisible and listen to their episode/check out their piece on it. 20:08 Hirsch/A Silver Bullet: Again, Ian Wolfe is a delight and I'm so excited that I know we get to see more of him in Season 4. Also, a silver bullet cocktail is a martini, but instead of vermouth, it has scotch. Yikes. I cut a bit in the episode of Rob and I discussing the... debatable palatability of such a cocktail, but ultimately, it's perfect for Mama, isn't it? 23:04 The Wizard Traquil: I want Rob to know about the dusty corners of the internet that I had to comb to find audio clips of Wizards and Warriors. Fansites with links to .wavs, gaudy HTML wallpaper... WEBRINGS, Rob. But you can avoid all these because the complete series is out on DVD! It's available as a "made to order" title from the Warner Archive, like print-on-demand, except on DVD. 24:10 Dungeon Majesty: This is a pretty niche reference, I will admit. Back in those halcyon hipster early-to-mid-'00s, we all became pretty infatuated with an internet/public access show called Dungeon Majesty, where four D&D players and their GM acted out their D&D campaign, complete with public-access-cable-level special effects. We then named our OWN Prime Time Adventures campaign about people playing a fantasy RPG at the time Dungeon Majesty in their honor, and things got even more meta from there, as people started writing fanfiction and Television-Without-Pity style recaps about our imaginary TV show-in-an-RPG. I sometimes miss the old days, when you could get that self-referential and not feel guilty about it. 25:00 White telephone films: This discussion just didn't fit into HMOTD 031 but it fits perfectly here. We actually cut about five more minutes of telephone history in our burglar alarm discussion, but I think the most interesting fun fact I found out about white telephone films is that, of course, the Italian film industry had their own ripoffs of them, and in Mussolini's Italy, they reinforced Fascist ideology (while needing to resort to foreign authors and settings to cover for controversial topics like adultery). Fascinating! I have been told by my wife of 10 years that I should mention that I learned about those deco-era "white interiors" from her on our podcast, The Whole Shebang and our discussion of Syrie Maugham. 27:48 N.C. Wyeth: I gotta be honest, I find N.C. Wyeth an odd choice for Mama to display in her living room. Not because I can't picture her putting up a painting of a hanging (if anyone knows which specific N.C. Wyeth painting this is a reference to, by the way, let me know, I couldn't find one), but because the elder Wyeth was not considered a fine artist in his day or even decades later in the early '80s. He was primarily an illustrator, doing paintings of boys' tales like King Arthur and Robin Hood, pirates and the Wild West, as well as images of American patriotism. He was sort of the Frank Frazetta of his day. 28:30 Fred Waring and his Pennsylvanians: Much like Guy Lombardo and his Royal Canadians, Fred Waring founded a wholesome musical troupe with a geographic name and made a name for himself catering to the middle-of-the-road "sweet music" tastes of listeners from the '20s and '30s onward. The blender bit is fascinating, as is this little tidbit from the Fred Waring Wikipedia page: "In the 1960s and 1970s, popular musical tastes turned from choral music, but Waring changed with the times, introducing his Young Pennsylvanians, a group of fresh-faced, long-haired, bell-bottomed performers who sang old favorites and choral arrangements of contemporary songs." One toke over the line, sweet Jesus. 30:05 “If you’ll excuse me, The Brady Bunch is on.” Still baffling, still random. But I think one thing that we'll be talking about in a future episode is that it's yet another in a long line of "exit lines" in WKRP that are just complete non-sequiturs, like "I gotta go buy a car," or "I gotta go bowling." 32:00 “Why The Brady Bunch?” Ah yes, this clip baffled Rob, who didn't stick out The X-Files to the bitter, painful end of Season 9, but who can blame him, really. This penultimate X-Files episode, "Sunshine Days," guest-starred Lost's Michael Emerson as a sad psychokinetic who turns his home into an illusion of The Brady Bunch house. In retrospect, this was kind of a genius meta-take on the power of television and long-running shows to inspire something close to (obsessive) love in their fans. The AV Club did a pretty great review of this episode a while back. 37:30 Happy anniversary, Jenny! I'm embedding this right into the Show Notes, I don't care. I think of it anytime anyone mentions an anniversary anywhere. Fred! You remembered! 44:15 Rob’s Paris trip: Guys, I would totally do a post-by-post podcast of Rob's old Livejournal entries. I'm a fan, what can I say. 48:00 Les’s primal scream: In case you forgot, Les was doing Primal Scream therapy in "Most Improved Station." 49:35 The Tantalus Field/The Agonizer: Yeah, Rob beats me in Star Trek: TOS knowledge. The agonizer was the hand-held pain-inflicter in the Mirror Universe, and the Tantalus Field allowed the captain of a Terran Imperial vessel to literally write a person out of existence. As a long-time gamemaster? That seems a bit overpowered to me. 52:20 The Big Guy’s sense of violation: I may be being too hard on the Big Guy as of late. We are all, after all, products of our own place and time. He's got a good heart, and certainly a better heart than a lot of the folks of his same age and milieu, as we'll see soon in "Clean Up Radio Everywhere." 1:02:50 Escape from New York/Death Wish piece and real-life vigilantes: Here's Kelly's Death Wish/Escape from New York piece, which as Rob says is a must-read. And as far as Bernhard Goetz and real-life vigilantes are concerned, I don't think we can overlook the publicity-seeking Guardian Angels, who were all over New York-area radio and television in the 1980s. 1:07:30 Private security, history of burglar alarms: Again, we cut a large wodge of content on the history of the intertwining of burglar alarms and Ma Bell, but if you want to potted version, hie thee to the Wikipedia entry on Edwin Holmes. Here's that story about firefighters letting a home burn because they were a subscription fire service. It was Tennessee not Kentucky, my apologies. Curious George pulled that fire alarm in the very first Curious George book from 1941. I also want to just say that I am aware of the idiosyncratically incorrect way I apparently say "bur-ga-lar," and that after hearing myself say it over and over again while editing this episode, I can only say in my defense that at least I share this sort of mispronunciation quirk with the famous and powerful. 1:11:48 "Just the Two of Us," Sandinista! : Sorry to harp on about Grover Washington, Jr. and Bill Withers, I just really like that song. Here's the full 7-minute version off of Winelight. It's another childhood, early-'80s WMJX-FM Bedtime Magic radio classic for me. And I have to admit, as I went to check out interesting fun facts about the Clash's late 1980 album Sandinista! I had forgotten it was a triple album. I like the Clash okay, but sometimes I think they can tend to be a little bloated on their own self-importance. Here's a link to the Sandinistas and to the history of Nicaragua in this period if you feel the need to brush up on your 1980s Reagan-era anti-Communist geopolitics. Which might not be a bad idea these days. Here's a link to our friends at My Favorite Decade: '76 to '85. And I'm so pleased that a lot of you are Juice Newton fans and came to her defense after my uncharitable assessment of her as a "one-hit wonder." 1:17:25 Boomboxes: This 10-minute video from NPR is a great mini-cultural history of the boombox. In the recently-closed exhibit on the history of radio at the museum where I work, a segment of our exhibit was dedicated to the portability of radio and how it affected the growth of both rock and roll (cheap transistor radios in the 1960s) and hip-hop (the boombox's boom in the 1980s). Best episode title ever. A truly memorable line.